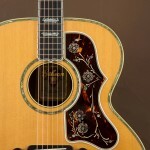 This is one of the coolest Gibson guitars on the planet. It is Serial Number 1 of the Gibson Monarch collection. 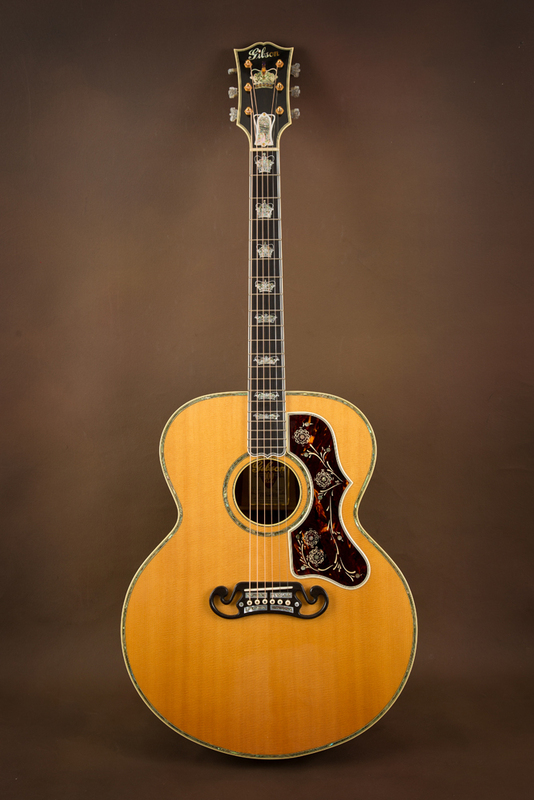 This guitar was hand-built by Ren Ferguson and John Walker in the Gibson Custom Shop in 1994. Gibson told Ren to design and build a guitar that would trump everything else on the market, regardless of price range. This is what he came up with. Since then, Gibson has built other Monarchs modeled after this one, but none compares to this one in craftsmanship, uniqueness, or cool factor. This is the only Monarch that was actually built by Ren Ferguson. The others were production-line models. 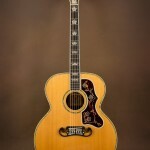 Ever since its introduction in 1938 (prototype in 1937), the Gibson SJ-200 has been marketed as “The King of the Flattops.” When the Monarch was introduced into the Gibson lineup, it was marketed as the King of Kings (hence, the name Monarch). As the first Monarch ever, this guitar is not only the King of all Monarchs, but all J-200s the world over. 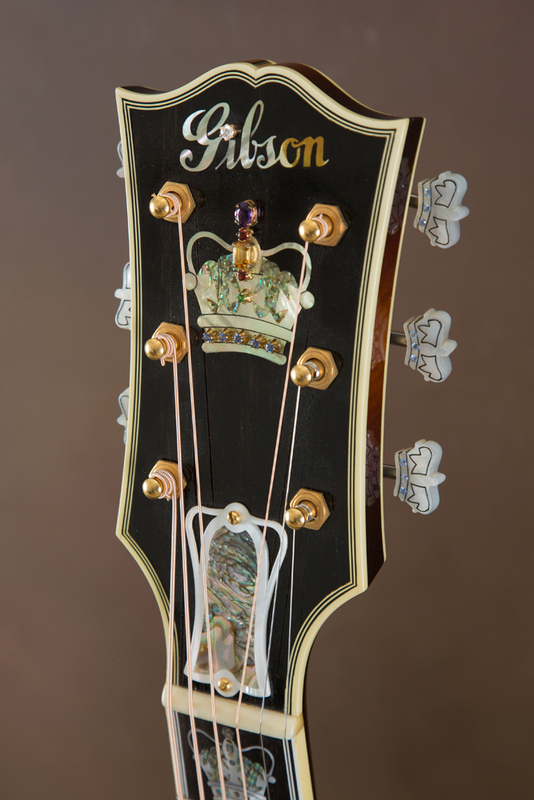 The obvious standout feature on this guitar is the inlayed King's Crown on the headstock. This King's Crown is different from the ones on all other Monarchs. The pearl-and-abalone inlays are more intricate and ornate, and the crown also features actual precious gems set into the crown. This includes real rubies, an emerald, sapphires, and amethysts. 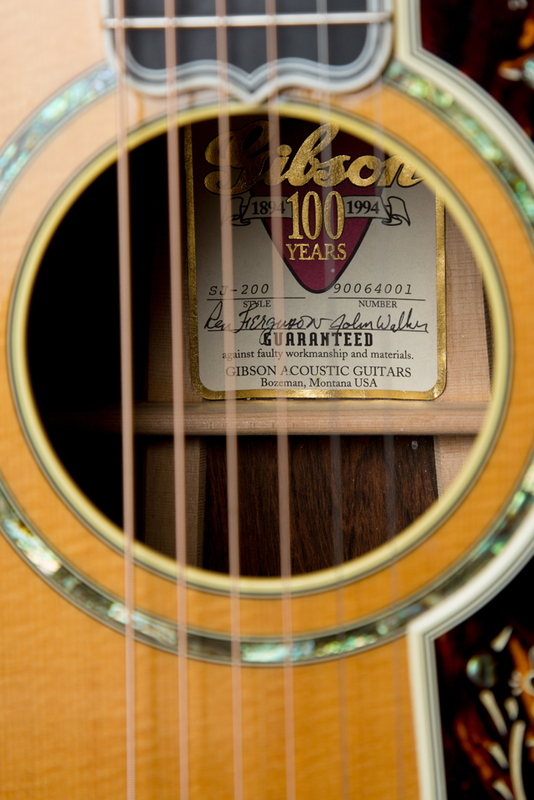 The dot for the “i” in the Gibson logo is a real diamond. Ren Ferguson said that these stones are of the highest quality. The craftsmanship here is unreal. None of the other Monarchs have these features. The crowns on the others are simple in comparison. You won't find another guitar like this anywhere. 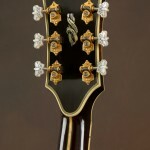 As you can see, the back of the headstock features the serial number inlayed in pearl. The “No. 1” beneath the serial number identifies this one as the first of all Monarchs. 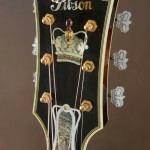 The back of the Monarch headstock is, in my opinion, the most beautiful back of any headstock Gibson has ever built. 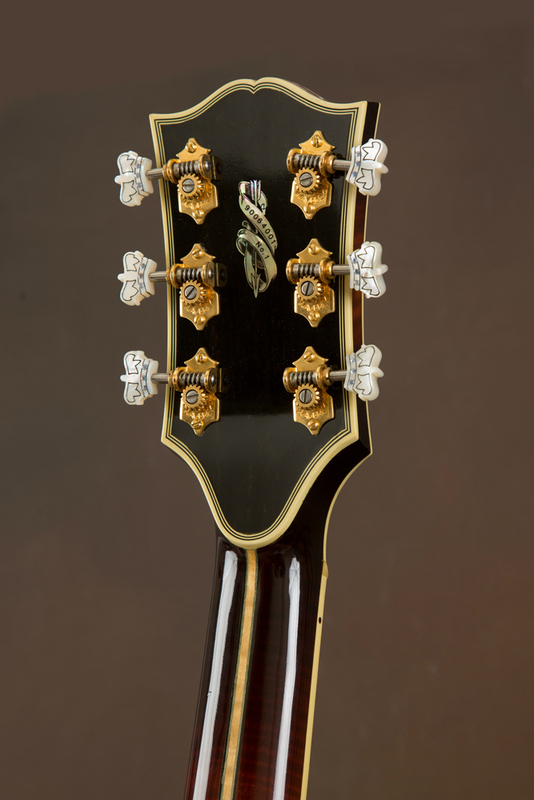 The tuners are three-dimensional hand-carved pearl crowns with inlayed amethyst stones. They are one-of-a-kind and completely unique to Serial Number 1. None of the other Monarchs have these tuners. The guitar features an ebony fretboard inlayed with extremely ornate crowns at each fret-marker. These crowns are much more ornate than the ones on the standard Monarch. 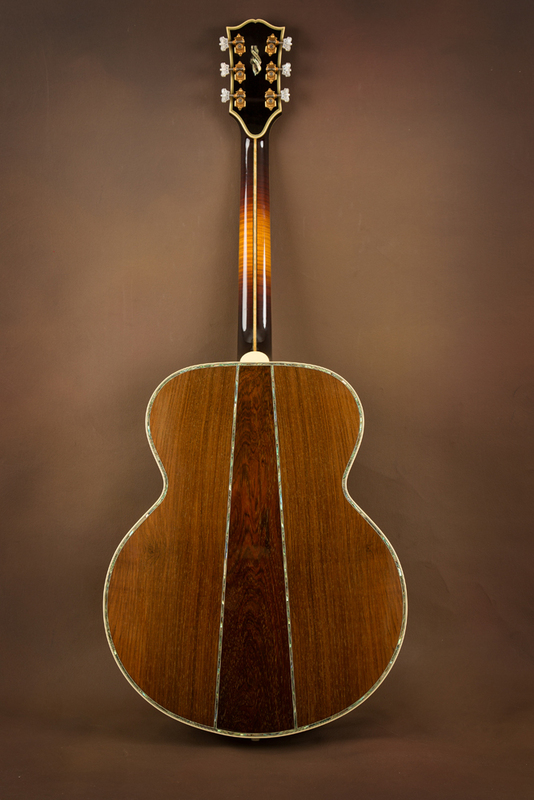 The back and sides of this guitar are Brazilian rosewood. I'm sure I don't need to explain the rarity of Brazilian rosewood. You just don't find very many Gibson guitars with Brazilian back and sides. As you can imagine, the tone of this guitar is superb. Ren Ferguson is one of the world's best luthiers. He does not spare any expense when building guitars, and this one is no exception. He would never build a guitar this fancy without making sure the tone matched the looks. It sounds phenomenal! The sheer volume of the this guitar is legendary. The bass response is enough to shake the legs off the chair you happen to be sitting on. It is simply amazing. 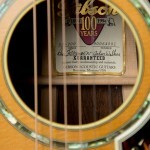 As you can see in the photos, Ren Ferguson and John Walker signed the label inside the guitar. This guitar has been well-cared for during its life. It has been played lightly and does show minor signs of use. There is one very light nick in the finish where the neck meets the headstock. Very small, no wood damage. There's an even lighter nick on the back of the neck which is almost invisible. The guitar has one small repaired top crack. The repair job was done by The Music Villa in Bozeman, Montana. Ren Ferguson himself actually shops at this store frequently. He inspected the guitar himself during the repair process. The repair is completely invisible when viewed from straight on. It is only visible (still very hard to see) when viewed from the bass side (the side where the crack is). The repair is seamless, meaning nothing can be felt when running your finger over the crack. If you were presenting this guitar to a friend, and you didn't tell them it had a repaired crack, they would never notice it. In the long run, a well-repaired crack does little, or nothing, to hurt the value of a guitar like this. 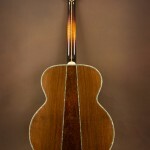 How many prewar Martin D-45s have you seen without at least one repaired crack? Cracks happen. Eventually every guitar in the world will sustain at least one. All Stradivarius violins have repaired cracks. This guitar is obviously not for the casual collector. This guitar is for someone who has a deep passion for Gibson and wants a guitar which has historical significance with the company. 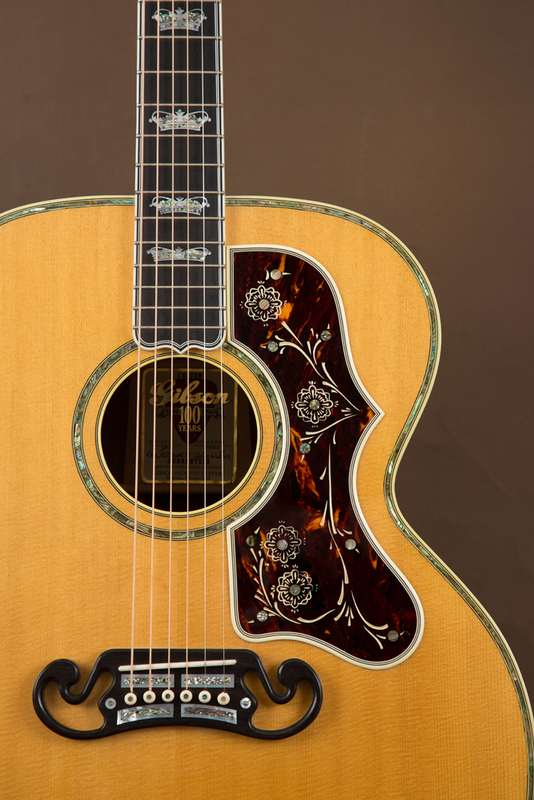 Just imagine what Ren Ferguson's guitars will be worth someday down the road. To have the first Monarch, and the only one ever built by him, is quite a special thing. This guitar will be the stuff of legend someday. Included is the original hardshell case.